Sorry it’s taken me so long to get back to this. I am back to tell you about some of the food we served at my parent’s 55th Anniversary party. A few of our guests offered to bring a dish so I always try to take my guests up on their offer. It sure helps to lighten the load and people like to contribute. One of our guests brought some smoked salmon and some really nice french bread. My aunt brought some nice looking shrimp and cocktail sauce. We served nachos, in the easy version. What we did here was we bought tortilla chips, cheese sauce and little paper serving boats all from Costco. The idea here was to put the cheese sauce in a crock pot to keep warm and then have chopped up onion, olives, tomato, sour cream etc. for toppings. Guests could then make their own nachos and top them with what ever condiments they like. If you haven’t noticed, I’m a big fan of self serve. Frees up the hostess and guests can serve it up just how they like it. So overall we had three appetizers and side dishes of chips, cheese, salsa, guacamole and cut up veggies like carrots and celery. I’ve never had a problem with quantity when giving party’s. No one ever goes home hungry. When in doubt about quantity, make more. Better to have enough than not enough. We made two pots (about 6 quarts each) of refried beans, 8 cups of Spanish rice two casseroles of the chile relleno casserole recipe and 8 lbs. of Mexican beef. All this food enabled us to make tostadas and burritos. Again we set this up buffet style. Chris had a big steamer which we placed flour tortillas wrapped in white terry towels. So at the beginning of the buffet people could choose between a crispy corn tortilla (for a tostada) or a flour tortilla for a burrito. I personally built a tostada with beans first, then a little rice and beef and then topped all that with a big hand of lettuce, delicious cider vinegar dressing and topped it all with a dollop of guacamole and a sprinkle of cheese. Delish. Let’s not forget the chile relleno casserole. It turned out great and everyone really enjoyed it. When you have a number of food items to serve like we did then you don’t need huge quantities of each item. People tend to take a little of everything. We had plenty of left overs just like we planned and were able to send people home with a nice dish of food. It’s a good idea to purchase to-go plates at costco just for this purpose. As I mentioned in an earlier post, Debbie, my sister in law, is a professional cake decorator and she made the cake. What a beauty it was. But before we served the cake, Chris whipped out his Sephra chocolate fountain and filled the house with wonderful chocolate aroma. 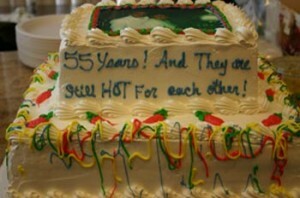 We served this with fresh strawberry’s (my favorite), marshmallows, cookies, pretzels, and pineapple. 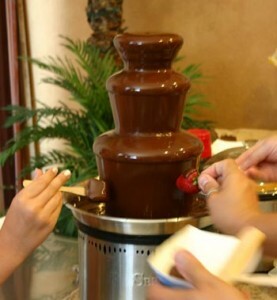 Everyone loved the chocolate fountain. Some of our guests had never seen one before so it was fun to watch everyone “ooh” and “aah” over it. If you want to know more about the Sephra chocolate fountain and tips for using one you can read about it by clicking the link. Guess what we served to drink that goes with our theme? Margaritas of course. Some were served with tequila and some were virgin margaritas. This worked out really well with the kids enjoying the ones without liquor. We also had a case of bottled water, 6 liters of soda (coke, rootbeer, 7up and orange) and one case of Corona Beer. All in all everyone had a great time. It was unfortunate that my mom wasn’t well enough to attend her party but her sisters and a few others were able to visit with her after the party. If you have ever given a party you know how things can keep you so busy that you forget things. Well that’s what happened to me. I got so wrapped up with visiting and cooking that I forgot to play a little game I came up with. I thought it would be fun to have a little quiz for the party. You can do this with just about any kind of party. I’ve done it with block party’s, Christmas party’s, Thanksgiving, you name it. Okay so what is it you ask? Well for my parent’s 55th anniversary party I came up with a quiz about my mom and dad asking silly little questions that people might know about them. Let me give you an example. My dad always had nick names for special people in his life. So one of my questions was “What three pet names did Alfonso have for Donna? Most people know that he calls her “buns”, “Donna Mae Jones” and “My Love”. Another question was: How did Donna get the nickname “Buns”? Quite frankly I didn’t even know the answer to that one. Turns out mom worked in a bakery when she met dad and he started calling her that since that is what she baked. Sounds like something my dad would come up with. I came up with 20 questions like those. I printed them on the computer and was going to read each question aloud. Everyone would have a piece of paper to write their answer on and would grade it themselves using the honor system of course. But unfortunately I never gave out the quiz. I plain forgot all about it. Of course I remembered about it after most people had left. My sister even bought a gift for the winner. It was a cute salsa dish and some salsa and chips. Fit right in with our theme. If only I had remembered. Overall the party was a great success and it was great seeing everyone, especially those that traveled far.